Mia Farrow’s avatar looks remarkably like her. Someone did a pretty good job. Ms Farrow, actor and UN goodwill ambassador has become one of the most vocal activists condemning the crisis in Sudan’s Darfur region. She joined the United States Holocaust Memorial Museum’s Committee on Conscience in taking the cause into Second Life. 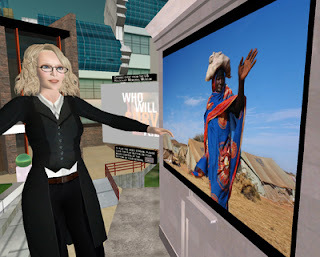 The event took place at a virtual replica of Our Walls Bear Witness – Darfur : Who Will Survive Today? the powerful, outdoor photography exhibition highlighting images of the Darfur crisis by leading photojournalists as projected onto the exterior of the U.S. Holocaust Memorial Museum in Washington, around this time last year. It’s interesting to see not only how Second Life is being used to hold seminars, press conferences, album launches and other meetings between people from around the world, but how it’s being used as a tool within a communications strategy aimed at mobilizing the global community around a cause that seems easy for most of us to ignore. I’ll have to delve into Second Life a little more to understand how these events are promoted, but even sitting on the outside and looking in, it’s easy to see the potential. I’ve brought the question of an Olympic boycott in support of Darfur to Facebook. French and English groups are now open to the global Facebook community, with links to online petitions, resources and first-hand testimonials. Promotion has begun within my own network, but I’ll soon be taking steps to bring the group to the attention of others I feel might be moved to increase its visibility and get the viral effect going. Publié le 2007.11.13 sous la rubrique . darfour, darfur, facebook, mia farrow, second life.